Patrick had painful scabs, but with one application of COAT DEFENSE® they were gone! Can you imagine? Scratches gone in just a WEEK?! COAT DEFENSE® TROUBLE SPOT DRYING PASTE has a thick consistency which creates a protective barrier that defends the skin cells from pathogens and moisture. Fungus and bacteria require moisture to survive and thrive. COAT DEFENSE® TROUBLE SPOT DRYING PASTE creates a dry environment to enable healing. It continuously draws out moisture which allows the body to repair damaged cells causing the skin to quickly knit back together..
For Scratches / Cellulitis / Mud Fever / Cannon Crud COAT DEFENSE® TROUBLE SPOT DRYING PASTE Dries and Draws fungus, bacteria, and general inflammation allowing for dramatic results. If you want to PREVENT equine scratches or have a horse with long feathers, check out our COAT DEFENSE® daily PREVENTATIVE POWDER. All you do is sprinkle it on their legs and rub it in. That’s it. See how from the video below! Niki shows us how she uses COAT DEFENSE® daily PREVENTATIVE POWDER to treat and prevent equine scratches. DON’T JUST TAKE OUR WORD FOR IT, HEAR WHAT EVERYDAY RIDERS ARE SAYING ABOUT COAT DEFENSE®! People tell us why they love COAT DEFENSE® products for keeping their horse comfortable, healthy and happy. 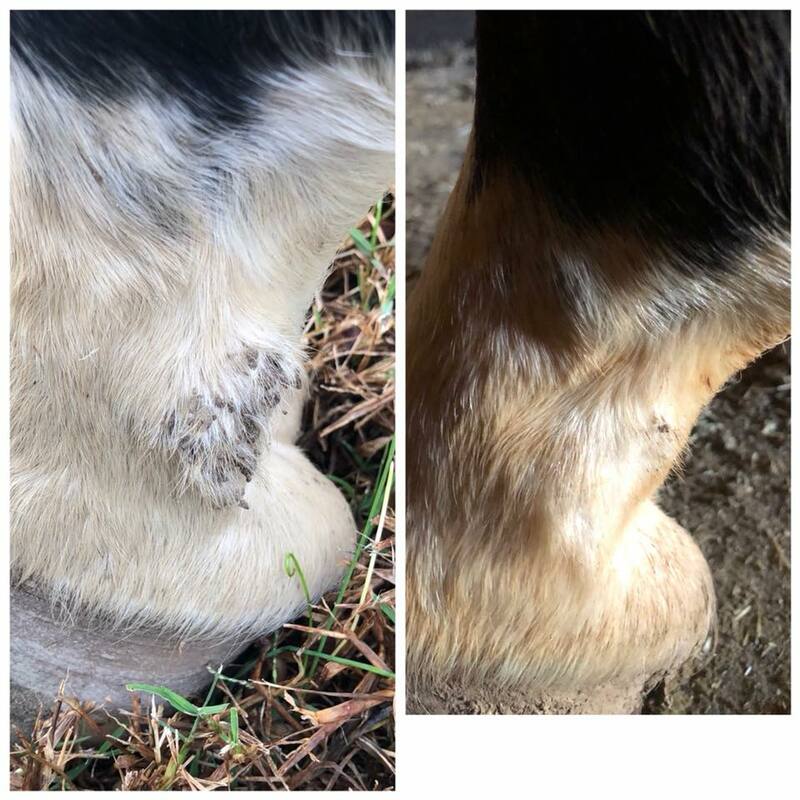 COAT DEFENSE® is the first all natural, non-toxic, organic equine product that PREVENTS and TREATS rain rot, proud flesh, rainscald, mud fever, sweet itch, equine scratches, cannon crud, ringworm, girth galls, summer sores, insect bites, wounds and much more.